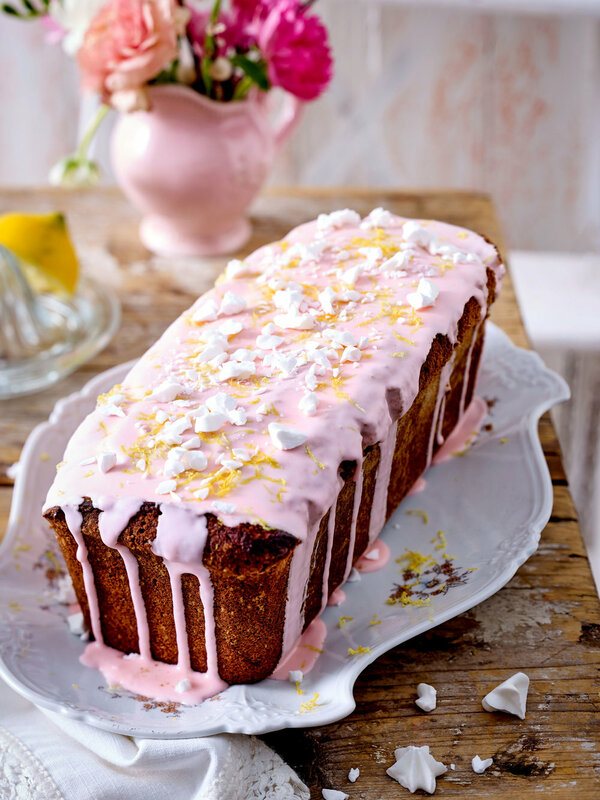 Drizzled with lemon flavour icing and scattered with crushed lemon sugar rosettes, this is a gorgeous teatime treat. In a mixing bowl, whisk the egg white with an electric whisk for 1-2 mins until frothy. Beat in the icing sugar, lemon juice and glycerine and continue to beat until a smooth paste. Line a flat tray with baking paper. Fill a piping bag fitted with a rosette nozzle with the royal icing and pipe approximately 40, 1cm sized rosettes of icing onto the paper. Allow to dry completely; ideally overnight. Preheat the oven to 180°C/gas mark 4 and grease and line the loaf tin. In a large bowl, cream together the butter and 225g caster sugar with the back of a spoon for 3-4 mins until creamy. Beat in the eggs one at a time, then sift in the flour, folding in until completely combined. Zest in the rind of 2 lemons and stir thoroughly. Transfer the mixture into the prepared tin and level out the top with the flat side of a table knife. Bake for 55 mins until an inserted skewer comes out clean. Allow to cool in the tin. Squeeze the juice of 1 lemon into a jug and mix in the extra 2 tbsp caster sugar. Make a few holes in the top of the cake with a skewer, down to the bottom, then pour over the sugary lemon juice and let it sink in. Leave to soak for 10 mins. Zest the remaining unzested lemon onto a plate and reserve for later. In a large mixing bowl, combine the icing sugar with the juice of the remaining lemons. Add the food colouring until the desired colour is achieved. Pour the icing onto the cake in a line along the centre of the top and let it drip down naturally. Sprinkle with the reserved lemon zest. Fold the piece of baking paper over the hardened icing rosettes then smash with a rolling pin until partially crushed. Sprinkle the crushed rosettes over the cake, then allow to dry and serve.